@JeffWeinerOS Can you confirm whether B37 was 1 of 2 jurors rejected by the State but empaneled by the judge per Defense Batson challenge? @Only4RM No, the two state strikes Judge Nelson overruled were E-6 and B-76. @JeffWeinerOS Sorry for bothering you but do you have notes on whether State has objections to B37? Was she considered after Batson issues? @Only4RM Neither side attempted to strike B-37. No objections from the state. @JeffWeinerOS @Only4RM Who were the 2 that prosecution Tried to strike Then? When I watched was sure she was 1 of them? @pannholt @Only4RM Defense challenged 4 state strikes: B-12, B-86, E-6, B-76. Judge Nelson overruled state strikes of E-6 & B-76. I will agree with Holder on one issue - there is no need for stand your ground laws. It is the INALIENABLE right of every creature to defend themselves. Even an amoeba - who has no "brain" - will swim away from painful things that could hurt it. But it is wrong to allow humans to do the same? If someone attacks you, as a human being, you are and should be allowed to use the force necessary to defend yourself and your family (and any other innocent people). Amazing to me that the same people who expect the general taxpaying public to provide everything for "poor" people do not want to allow self defense. @pannholt @Only4RM Robert Hirschhorn. Not local, based in Texas. If Trayvon Martin's parents file a lawsuit against George Zimmerman, they face a huge obstacle: Florida's "stand your ground" law. That much-debated statute provides immunity not just against criminal charges but also against civil suits. Benjamin Crump, an attorney for Trayvon's parents, would not say Tuesday what their plans are. "We're not even thinking about it right now," he said. Parents Tracy Martin and Sybrina Fulton "are still trying to deal with the tragedy of this verdict." A six-member jury acquitted Zimmerman, a 29-year-old Neighborhood Watch volunteer, July 13 after listening to three weeks of testimony, concluding he did not commit a crime when he shot and killed the unarmed black 17-year-old. But on Feb. 22 — months before the criminal trial — Crump attorney Bruce Blackwell told Circuit Judge Debra S. Nelson that the family intends to sue. Theirs would most likely be a wrongful death claim or one alleging negligence. Central Florida defense attorneys said Tuesday that just because Zimmerman was acquitted, that does not mean he won't be sued, but it does indicate the evidence weighs in his favor. If Zimmerman is sued in this case, a judge would determine whether "stand your ground" applies. If the judge rules it does, Zimmerman would be released from liability. If the judge rules against that claim, the case would be tried before a jury. Moments after Zimmerman was found not guilty, defense attorney Mark O'Mara said, "If someone believes it's appropriate to sue George Zimmerman, then we will seek and we will get immunity in a civil hearing, and we will see just how many civil lawsuits will be spawned by this fiasco." That was a reference to a "stand your ground" hearing, one not yet held in this case. Although O'Mara said shortly after the shooting that Zimmerman would challenge his criminal prosecution under that statute, defense attorneys ran out of time and opted to simply take the case to a jury. The statute, enacted in Florida in 2005, provides criminal and civil immunity to anyone who uses deadly force if he has a reasonable fear of imminent death or great bodily injury. O'Mara contends his client did, that he shot Trayvon Feb. 26, 2012, in Sanford after the Miami Gardens teenager knocked him to the ground with a punch that broke his nose then climbed on top and began banging his head against a sidewalk. @MarkNeJame @scs0003 so instead of blaming the state prosecutors you should go question Judge Nelson why she denied the acquittal then! @MarkNeJame @scs0003 overcharging is just crazy! Judge Nelson ruled that there was enough evidence for a M2 conviction! "Stand your ground" "Castle law" "Stay off my lawn"
Beat my head on a sidewalk and me and your next of kin can debate till the cows come home. I've been listening to commentary on the radio. Some folks seem to think that Zimmerman stepped over the line when he asked Martin a question. In their mind, this made Zimmerman the aggressor. The host suggested that in this country, we have the right to ask questions. How many have been solicited in cities large and small (Seattle, Chicago, New York) by pan handlers? IIRC, Obama's white grandmother, was solicited by what what he profiled as an 'aggressive' panhandler who was black. Being scared, she was apparently afraid to go to work or take the bus or something. Obama, iirc, used this incident to label her a 'racist' - something about noticing his own blackness and comparing it to the panhandler. Maybe Martin was a racist too? What doesn't he seem to have noticed? Learned? Did she turn around and beat the pulp out of the panhandler? Take offense at his asking a question? Was Zimmerman like that panhandler Obama's white grandmother faced decades ago? Would grandma have beaten the tar out of him? What of other homeless people? Panhandlers? Marketers at the mall? Over the phone? When did asking questions become a bad thing? 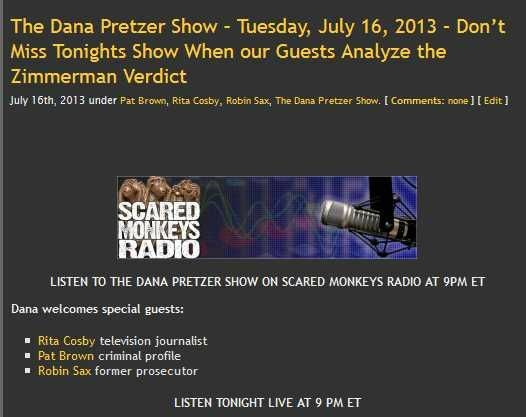 Link to the show will be posted on the front page of scaredmonkeys.com in about 30 -40 minutes. MIAMI (AP) — The Justice Department will sift through trial testimony, interviews and other evidence during what is likely to be a months-long investigation into whether George Zimmerman violated Trayvon Martin's civil rights when he shot the black teenager. The key to charging Zimmerman, a former neighborhood watch volunteer, lies in whether evidence exists that he was motivated by racial animosity to kill Martin, who was 17 when he was shot during a fight with Zimmerman in February 2012. And while Martin's family has said the teen was racially profiled, no evidence surfaced during the state trial that Zimmerman had a racial bias. Former Miami federal prosecutor David S. Weinstein says it will likely be months before a decision is made on whether to bring charges. Zimmerman, 29, was acquitted of second-degree murder and manslaughter charges after claiming he fired his weapon in self-defense only after Martin attacked him. His friends and family have repeatedly denied he harbored racial animosity toward blacks. Florida did not use its own hate crime laws against Zimmerman. The defense admitted that looking back either #Zimmermanon9 or Martin could have walked away and Martin would be alive. The defense just said that Jeantel never mentioned Martin was afraid of #Zimmermanon9 until the defense deposed her and the trial. Retweeted by Seminole County S.O. Four of the jurors in the George Zimmerman trial issued a statement late Tuesday saying that juror B-37, the first to speak out in the media, does not speak for them. "We, the undersigned jurors, understand there is a great deal of interest in this case. But we ask you to remember that we are not public officials and we did not invite this type of attention into our lives. We also wish to point out that the opinions of Juror B-37, expressed on the Anderson Cooper show were her own, and not in any way representative of the jurors listed below," the four jurors wrote. The statement was released about an hour after B-37 gave the second part of a two-part interview to CNN's Anderson Cooper explaining how the jury reached a verdict in the murder case and sharing her thoughts on the case. The first segment aired Monday. The four jurors also appealed for privacy. The sixth juror, whose jury number did not appear in the list of those who signed the document, was the only minority on the panel. She is described as black or Hispanic and married with children. She lived in Chicago when the shooting happened. I was watching the All Star Game... Love me some Mo ! Plz disregard above post... I found it !!! MIAMI — Civil rights leaders said Tuesday that they are planning vigils and rallies in 100 U.S. cities, including Detroit, this weekend to press the federal government to bring charges against a former neighborhood-watch volunteer acquitted in the killing of an unarmed black teenager. “People all across the country will gather to show that we are not having a two- or three-day anger fit. This is a social movement for justice,” Rev. Al Sharpton said as he announced the plan outside the U.S. Department of Justice in Washington, D.C. The rallies and vigils will occur in front of federal buildings at noon Saturday in Detroit, Los Angeles, Chicago, Philadelphia, New York and other cities. Sharpton said vigils will be followed by a conference next week in Miami to develop a plan to address the Stand Your Ground law. The law gives people wide latitude to use deadly force if they fear death or bodily harm. According to a Washington Post report, the law began in Florida in 2005 and has spread to more than 30 other states — including Michigan — as a result of a campaign by the National Rifle Association and a corporate-backed group called the American Legislative Exchange Council, which promotes conservative bills. The Justice Department has said it is looking into Martin’s death to determine whether federal prosecutors will file criminal civil rights charges against Zimmerman, who is now a free man. His lawyer has told ABC News that his client will get his gun back and intends to arm himself again. The key to charging Zimmerman lies in whether evidence exists that he was motivated by racial animosity to kill Martin. Martin’s family has said the teen was racially profiled, but no evidence surfaced during the trial that Zimmerman had a racial bias. Zimmerman’s friends and family deny that he harbored animosity toward black people. Still, supporters of the Justice Department filing civil rights charges said additional evidence could exist in the federal investigation that didn’t come up in the state case. Beyond the exact language of the law itself, the federal probe must navigate between sensitive racial and political issues that arose when Zimmerman initially wasn’t charged in Martin’s killing. Calif. protests turn violent: In Los Angeles, people ran through streets Monday night in a third night of demonstrations, attacking others, breaking windows and raiding a Walmart, while others blocked a major freeway in the San Francisco Bay area. Fourteen people were arrested. In Oakland, at least one person was injured and nine arrested in a protest. On Tuesday, Los Angeles police vowed to crack down with quick action and arrests if further disturbances arise. Juror drops book plan: A juror in the trial said Tuesday she is dropping plans to write about her account of the case. The woman had planned to write the book with her husband, an attorney. The literary agent, Sharlene Martin, also announced that she had decided to rescind her offer of representation.